A suicide bomber has rammed a car full of explosives into the gates of the Indian embassy in the Afghan capital, killing 41 people and injuring 141. Five Afghans died at Indonesia's embassy nearby. No-one has admitted being behind the attack, the deadliest in Kabul since the overthrow of the Taleban in 2001. Afghanistan has seen a sharp increase in violence, particularly in the south and east - and Taleban militants recently vowed to step up their attacks in the capital. But the latest blast - in what was supposed to be a secure area of Kabul - will greatly concern Afghan government officials, says the BBC's Martin Patience in Kabul. 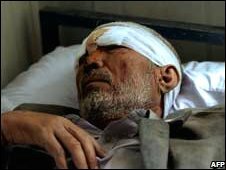 Afghan President Hamid Karzai said the attackers wanted to rupture good relations between Afghanistan and India, while the Afghan interior ministry said it believed the attack was carried out "in co-ordination and consultation with an active intelligence service in the region". It did not specify which intelligence service it suspected of involvement. But in the past, Afghanistan has accused Pakistani agents of being behind a number of attacks on its soil. In a statement, Pakistan's foreign minister said his country "condemns terrorism in all its forms and manifestations". India also condemned the "cowardly terrorists' attack", but vowed it would not be deterred from fulfilling its commitment to the government and people of Afghanistan. India has close ties with Afghanistan and is involved in aid and reconstruction work, including the building of Afghanistan's new parliament. The US condemned the "needless act of violence", as did the European Union, which described it as a "terrorist attack targeting innocent civilians". The United Nations envoy to Afghanistan, Kai Eide, said that "in no culture, no country, and no religion is there any excuse or justification for such acts". The bomb exploded as people were queuing for visas at the embassy. "We were standing in a line to get visas, the police told us to stand on one side, the women were in another line, then suddenly I heard a huge bang and I sat down. I was very afraid," Khan Zaman said. Ali Hassan Fahimi said shrapnel had landed in his office, which is close to the site of the blast. "It was so strong... and our staff were shocked," he said. A spokesman for the Afghan defence ministry, Gen Zaher Azimi, told the BBC the attack was "the deadliest since the fall of Taleban" in Kabul. Another Afghan government spokesman, Zamari Bashari, told the BBC he thought the embassy had been attacked because of India's involvement in the reconstruction of Afghanistan. He said that the terrorist enemies of Afghanistan wanted such work to stop. 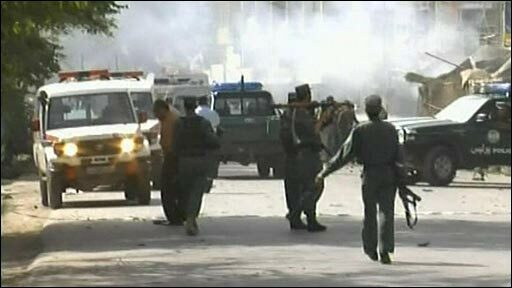 Afghan Foreign Minister Rangeen Dadfar Spanta visited the Indian embassy shortly after the attack, his spokesman said. "India and Afghanistan have a deep relationship between each other. Such attacks of the enemy will not harm our relations," Mr Spanta told the personnel at the embassy, the spokesman said.